According to an article posted by Lonely Planet in June 2012, Nome has the #10 of ten of the spookiest structures in the world! 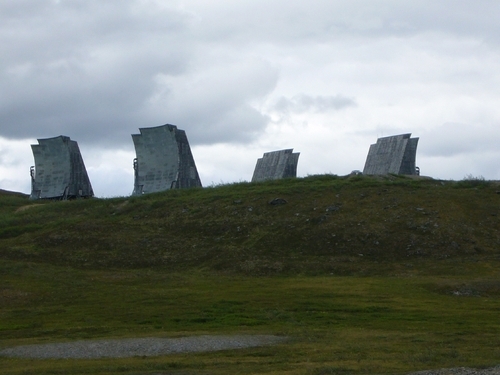 Overlooking the town and the Bering Straits from atop Anvil Mountain is White Alice, an iconic, weird Cold War relic. From down in the town, and if flying into Nome on a clear day, it looks like a bizarre space-age Stonehenge. The four strange corrugated iron sound reflector structures are in fact the remnants of a radar/missile defense system from the 50's and 60's that was intended for listening to suspicious Soviet activity. There are rumors that the Air Force is going to tear down the structures despite the objections of the town. I worked for a short time at this one. These were Microwave Reflector dishes shaped like billboards for telephone service in the Nome area. Each one had a 10,000 Watt power amplifier and a pair of receivers connected to them. 2 pointed west and 2 pointed east. They had nothig to do with sound or listening. The stations like this were made to link the USAF Aircraft Control and Warning stations and other services together. There was a time when one of the stations linked to a radar and a separate Inteligence gathering facility on Saint Lawrence Island.